Drawing on the old Polish recipes, our Mazury Active Spa has created its own cosmetic line destined for SPA treatments. We intend to take our Guests on a magical journey back to those times when nature and human touch made the best care rituals ever known and performed. Please book your treatments in advance so that we can find the most suitable date for you. masaż z peelingiem wulkanicznym 269zł/60min. It’s a luxurious Cleopatra bath combined with a face and body massage for a better vitality of skin. Indulge yourself in the sensual note of rosewood, cedar, amaranth oil, rose oil and vanilla. If you purchase cosmetics destined for face and body care, you’ll get 15% discount on the treatments. Obłędnie aromatyczny rytuał na ciało, z nutą truskawkową lub jagodową. Relaksacyjno-odżywczy masaż prawdziwą czekoladą. Doskonały dla skóry suchej, wymagającej regeneracji i wygładzenia. Are you stressed and tired? Here comes your rescue! Our new treatment - Tranquillity Pro Sleep Massage. This aromatherapeutic treatment is based on special brushes. Combines the power of touch, sound and aromatherapy. To put it more precisely, this procedure unites the Ayurveda techniques and the blissful Balinese massage. Brings deep relaxation, calms you down. Your mind is at peace and your body is light. 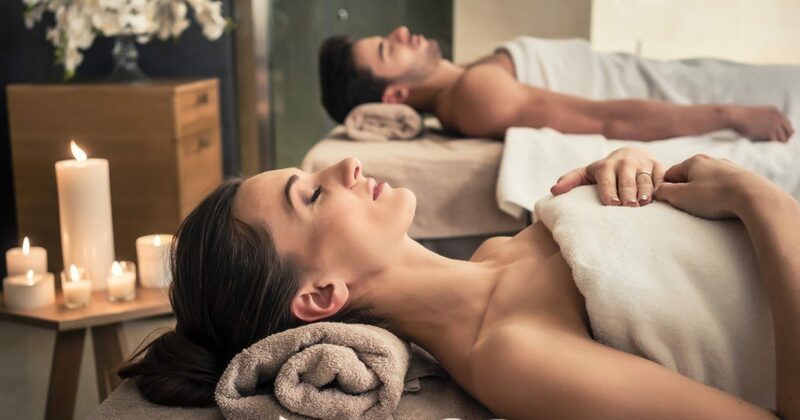 A deeply relaxing massage with warm oils (chocolate or organ oil) which not only takes care about your heart and soul, but also shapes your silhouette, harmonizes your senses and your spirit. The blissful power of touch, soothing both body and senses, has been known since the ancient times. Needless to say, the classic massage is still a vital part of the natural medicine. No words can describe how powerful is the touch and how it can heal the human body. It calms down your soul, loosens tensions, helps you keep your muscles lithe and your skin firm for long. A highly energising massage which raises our vitality level up and fills us with strength to carry on. Calms down your body and soul, treats headaches, pains in the muscles, spine and joints. Improves the blood circulation and thereby supports the slimming process, sets you free from tensions and mental blockades. In this way, your internal balance is restored and you find the nirvana of your psyche. A cleansing massage which stimulates the metabolism, expels toxins, improves skin elasticity, makes it smooth and reduces cellulite. A relaxing – regenerating massage, nourishing your scalp with argan oil. Brings internal soothing and loosens your tensed muscles. Additionally, it stimulates circulation, improves the absorption of cosmetics. The massage must be made systematically and very softly, that’s of a paramount importance. Thereby, your skin becomes elastic, smooth and firm. Brings instant soothing for tired feet, stimulates blood circulation and improves the metabolism, helping your body to get rid of toxins. Niezwykle skuteczna i bezpieczna metoda terapii polegająca na uciskowym masażu stóp. Pobudzając je i odblokowując, refleksologia uaktywnia samo-uzdrawianie organizmu, poprawia przemianę materii, wspomaga odchudzanie i oczyszczanie z toksyn, łagodzi bóle i nerwobóle różnego pochodzenia, redukuje stres i napięcie nerwowe, pomaga w zaburzeniach snu. Odpręża ciało i relaksuje umysł. Holistyczny, energetyczny masaż całego ciała. Przez swój subtelny i delikatny charakter oczyszcza pamięć komórkową ciała, uwalnia wewnętrzne blokady i stare wzorce myślowe z podświadomości. Masaż PeLoHa rozładowuje stres i napięcia mięśniowe. To połączenie masażu klasycznego, polinezyjskiego, metody Bowena, refleksologii, akupresury i metody Reiki. Masaż relaksujący oraz leczniczy, zmniejsza napięcia nerwowe. Pozwala uzyskać stan pełnego odprężenia, regeneracji i rewitalizacji. Wykonywany za pomocą specjalnych kijów bambusowych, pobudza tkanki głębokie i przyczynia się do wymodelowania sylwetki, usprawnia krążenie limfatyczne i żylne, przy czym pozwala pozbyć się cellulitu. Działa jak potężny zastrzyk energii, przynosząc ulgę zmęczonym i opuchniętym kończynom. A treatment based on exfoliating and nourishing ingredients. It’s an active combination aimed at a controlled cellular renewal, regulation of the hydro-lipid layer and strong illumination of skin and improvement of its texture. Perfect firming. Fights against cellulite and shapes your silhouette. Properties: improves micro circulation, expels toxins, reduces cellulite, smooths and firms your skin. Shaping the silhouette with ultrasound which penetrates deep into the skin and thereby effectively reduces the adipose tissue in chosen body parts. Thermogeniczny zabieg kształtujący sylwetkę o silnym działaniu wyszczuplającym i antycellulitowym. Prawdziwy HIT – efekty widoczne po pierwszym zabiegu. Zabieg prezentowany w programie Dzień Dobry TVN. Elsluzywny zabieg przeciwzmarszkowy i silnie odżywczy, wzbogacony wyselekcjonowanymi składnikami aktywnymi. Zabieg liftingu volumetycznego z zastosowaniem nanokrystalicznej technologii składającej się z radiofrekwencji subablacyjnej, stymulacji nerwomięśniowej, peelingu volumetycznego i terapii kriogenicznej. Cena zabiegu: 260-360zł/ 50-75 min. A treatment effectively unblocking the sebaceous glands, regulating the sebum secretion and refreshing the combination / seborrhoeic skin type. Tworzy naturalną powłokę ochronną, przy czym zmiękcza skórę dłoni i regeneruje. Daddy: Moss with teak tree – a vital body massage with oil Me: Banana Craze – face and body massage with Shea butter lotion by the Kids spa brand Free of charge Access to the pool and wellness zone 1,5 h.
Mummy: Sensual raspberry and saucy lemon – a relaxing whole body massage Me: Melon Feast – face and body massage with Shea butter lotion by the Kids SPA brand Free of charge Access to the pool and wellness zone 1,5 h.